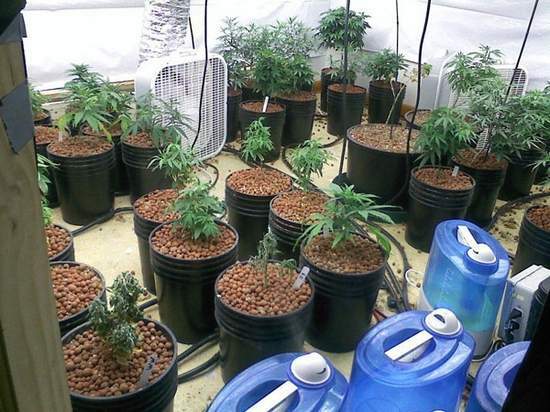 Courtesy Breckenridge Police DepartmentPolice have discovered four home-growing operations like this one in Breckenridge in the last six months. BRECKENRIDGE, Colo. – The Breckenridge Town Council unanimously adopted an ordinance Tuesday restricting the growing of medical marijuana in private homes following the discovery of four residential grow operations and a letter from a 13-year-old local boy complaining about the smell of marijuana in his neighborhood. Under the new ordinance, no more than 12 marijuana plants can be cultivated in a private residence in Breckenridge. Also, grow operations must be in compliance with all existing building codes, and the marijuana cannot be perceptible in any way, including by smell, outside the residence. Violators of the ordinance will face separate misdemeanor criminal charges for every day any portion of the ordinance is violated. Amateur marijuana-growing operations out of private homes are often set up with systems, equipment and chemicals that present significant fire and safety hazards, Breckenridge Police Chief Rick Holman and chief building official Glen Morgan told the council at Tuesday’s meeting. In the past six months, Breckenridge authorities have discovered four large grow operations in private houses in town, the biggest of which housed more than 200 small plants. Three of the four growing operations have now been shut down. Morgan and Holman said they were concerned about fire risks from unsecured wires in rooms often wrapped in flammable plastic to enhance lighting for the plants, as well as mold in the humid grow rooms and explosive chemicals sometimes used to draw THC from the plants. The marijuana grown in one of the Breckenridge homes was being cultivated by a caregiver for several licensed medical marijuana users who lived on the Front Range. In at least two of the four home-growing operations discovered in the last six months, the medical marijuana could be smelled outside the house, and in three of the cases renters were growing the marijuana without the knowledge or approval of the landlord – which is now prohibited by the ordinance. The ordinance restricts residential medical marijuana cultivation in Breckenridge to the letter of state constitutional law. Amendment 20 to the Colorado Constitution, approved by voters in 2000, allows patients licensed to use marijuana for medical purposes and one live-in caregiver to each grow six plants out of their home for private use. The new ordinance allows up to 12 marijuana plants to be grown within a 100 square-foot contiguous space in a private residence as long as they are not in any way perceptible outside the house and are not accessible to anyone without a medical marijuana license. The measure gives the Breckenridge police the right to enter residences in town where medical marijuana is grown during “reasonable hours” to inspect the house for compliance with the occupant or landowner’s permission or with an inspection warrant issued by a judge. The letter explained his frustration with marijuana in his community, from the smell on the gondola to the neighborhoods where children live. The boy’s neighbor, who was growing pot in a residence, had an exhaust system that blew the marijuana odor near the boy’s front door. The boy said he got tired of the smell and finally wrote the letter to the council.